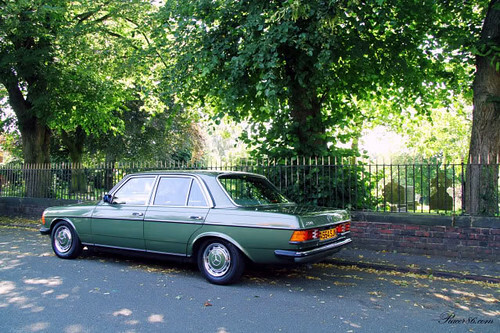 We’ve always been big fans of the W123 Mercedes-Benz, and blogger Rob Richardson’s example is as gorgeous as any we’ve ever seen— we love, love, love the color on his car. Rob was nice enough to chat with us and answer a few questions. RR: I wanted a daily driver classic and these cars are famed for their reliability, engineering, and ability to cover distance. I have a pretty long motorway commute to work so the old Benz is perfect for wafting along and soaking up the miles whilst reclining into an armchair. It’s basically like being in my front room, but with a steering wheel. MCB: How did you find it? RR: By total accident. I’d spent far too much time and money building a 1985 BMW E28 5-Series as my daily (itself no slouch —Ed.) with the intention of keeping it a good while. I saw the Benz advertised whilst browsing the ‘net and, well, the rest is history (and so is the E28). MCB: What’s it like to own? RR: Amazing. It’s like owning a modern car in terms of practicality, reliability, comfort, and to some degree fuel consumption, but it doesn’t look like a fridge, is properly screwed together, and you feel like a movie star (read: dictator) as you cruise around. It’s a statement car, especially using it everyday. MCB: What’s it like to drive? RR: It’s like sailing a massive boat on a sea of marshmallow. In a good way. It rides perfectly even with over a 4″ drop. The performance is, shall we say, leisurely, but for me it’s not an issue as I drop onto the motorway in the morning, cruise at 70-80mph and then do the same again at night for a 100 miles a day. This car was not built for anything as crude as a 0-60 dash! 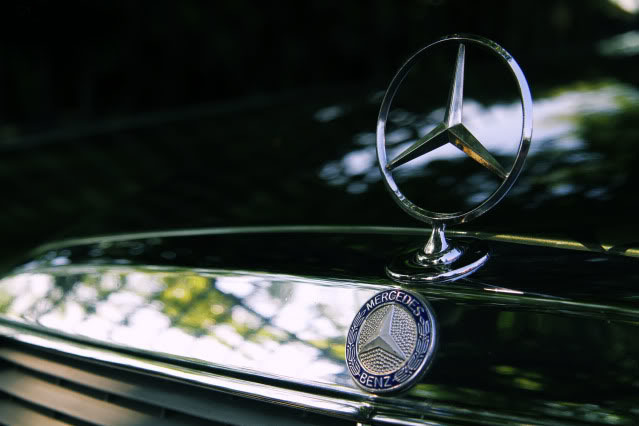 MCB: What makes you love this car? RR: I’m an automotive development engineer in real life and the engineering geek in me loves the thought, design, and engineering that’s gone into this car. Every last part on it is “finished” to an amazing level of detail. My favourite part is still the pneumatic central locking; watching those door pins rise like a Bond girl out of treacle is pretty special. MCB: What should a person look out for when buying one? RR: Rust. These cars rot and will ruin your life. Everything else on them is pretty bombproof. MCB: What can a person expect to pay? RR: Anything from £100 for scrap to £7-8k for a show condition car. It’s a statement car, especially using it everyday. MCB: What else have you owned? And what would you like to own in the future? RR: Lots, how long have you got?! 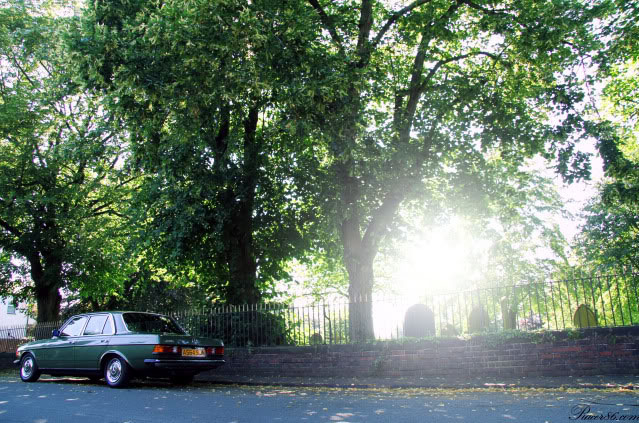 I’ve had everything from Minis, Chevettes, E28/E30/E36 BMWs, two Mk1 Eunos Roadsters, and a Porsche 924 to my current fleet of a ’68 Triumph Herald Cafe Racer, ’76 Toyota KP30 Mountain Racer, and the Benz. Obsessed? Probably! 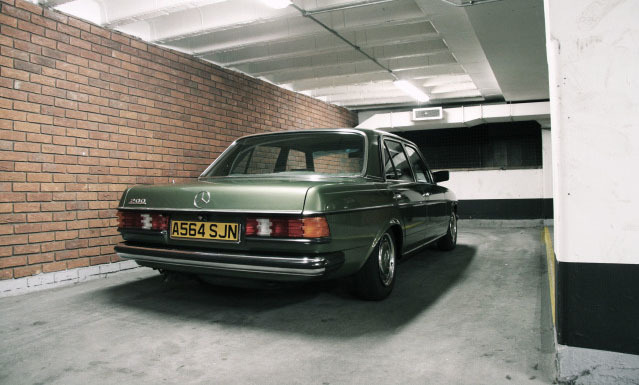 In the future, I’d like to own something like a pre ’73 911 and a KPGC10 Skyline or similar; who knows what the classifieds will throw up when I’m not expecting it! RR: They are both brilliant cars, but your choice should come down to this: do you want to go fast or do you want to go far? 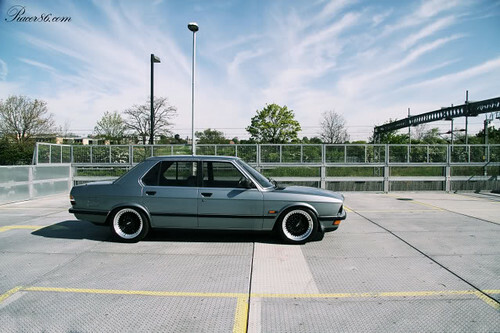 If you require any level of dynamic performance get an E28. 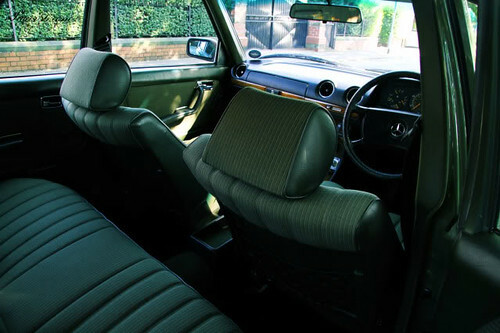 I’d say from a handling and performance point of view the E28 has it covered; I mean who doesn’t want to drive a 3.5 6-pot fast!? 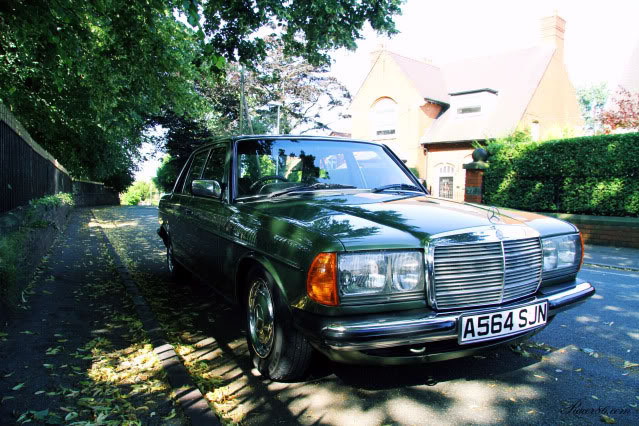 The W123 on the other hand, for me, will only ever be a Gentleman’s express: point it where you want to go, sit back, relax, and effortlessly cover vast distances. RR: Life’s too short to daily a dull tin box! Visit Rob’s site, Racer86, for details on all of his cars/builds. ~ by velofinds on November 2, 2012. As a daily driver for a W123 (84 300D Turbo) I can back up everything said in this article. These cars are built like tanks (Except for the leaky vacuum system) and are definitely built for the long haul and even for a “slow” car, you get the feeling that they can go 60-70mph all day long. They are also extremely comfy and are great road trip cars (I’ve taken mine on one from Phoenix to California) Definitely proud to own one. 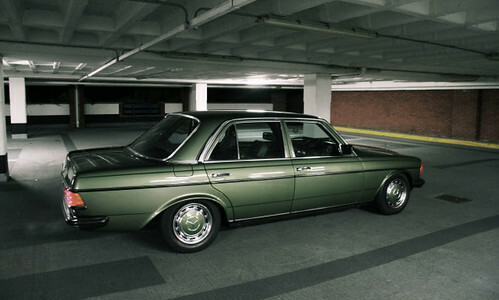 Beautiful – I agree the green really works on this (I doubt I could say that about this color on many other cars). 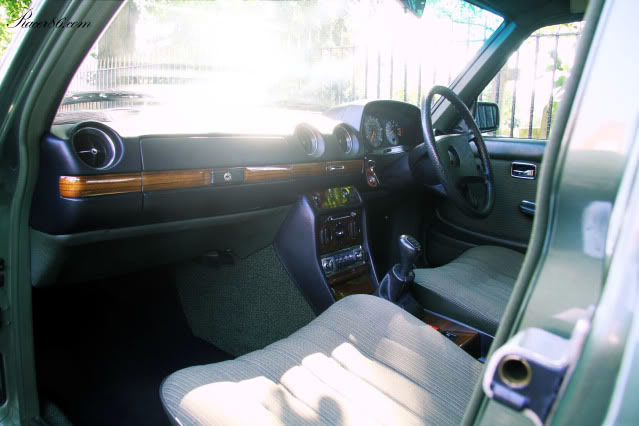 Of course, manual transmission W123’s are quite rare here in the states, so seeing such a nice example stirs even more envy. Love this car, love this post. Glorious! 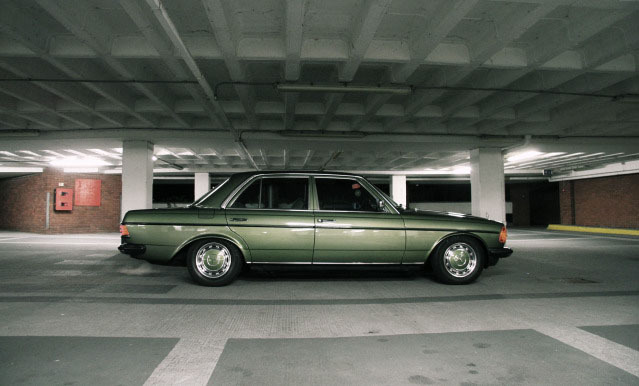 Make me miss our old W124 accordingly. Magnificent cars. 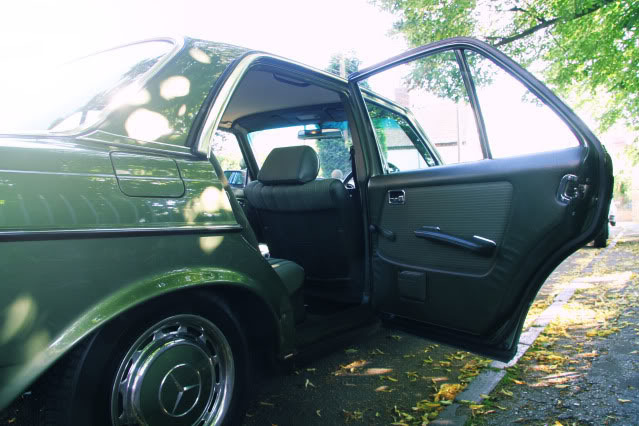 Nice W123 video (touches on a lot of the same themes that Rob describes), though the car is in nowhere near the same league as Rob’s example. US car with a rare 4-speed manual now available. Lovely! This is a very beautiful W 123. Chapeau! Hi Rob. 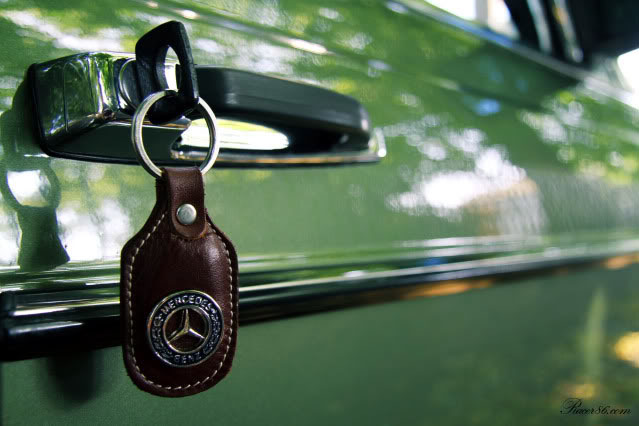 I have a 1984 Mercedes 200 Automatic, and bought it 7 years ago. 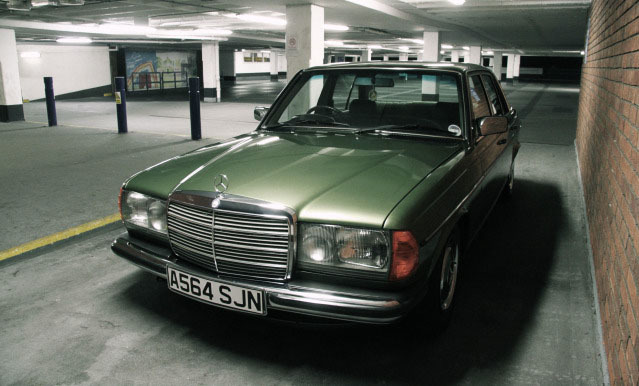 I am the 2nd owner Fantastic car (336,000kms – 210,000 miles)) the cylinder head has never been removed. Geoff. Ich bezweifle, dass er Deutsch spricht. Hi Rob, indeed this is one of the best i own. It’s a great fell to drive early morng on a lonley highways, we enjoy W123 200D fully during weekend long drives and supr’b on road. Hi Rob, this is my 4th w123 200E. Always thinking of the tank type of car. Bought it last Friday with 1 owner and 350K kms built in 1979. Planned to keep it just like you as daily use and classic. Live in Singapore and had a similar W123.230 in Melbourne.